Traditionally, veils are worn by women to protect them from evil spirits. Nowadays, veils are considered as a form of adornment or an accessory part of an overall look. Choosing a veil defines aspects of your appearance that should be considered to match your bridal gown, the shape of your face, your hairstyle, your location and your body shape. Brides now have the leisure of choosing a design she most likely desires. In selecting the perfect veil, there are considerations that should be put into mind. Assessing the focal points in the dress is the first step to be considered. If the dress has a back detail or an embellished bust panel you want to show, selecting a veil that ends before the point of detail in your dress should be one of your idea, another is to use a sheer style that is long enough to see through the details. 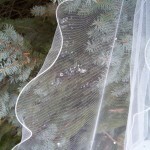 The design or decorations around your dress is another thing to consider in selecting your veil. Formal weddings are likely to accommodate an elaborate dress and an elaborate veil like the royal weddings. But if you have a simple dress with simple designs, you can have a more elaborate veil to compliment your look and if you have a more elaborate dress, choosing a simple veil can be flattering to your overall look. There are several styles a wedding gown can fall under that veils should work with. First is the sophisticated style which is discreet attire free from all the fussy details making the look creative and diverse creating a touch of astonishment. Second is the classic style usually known as the formal style very balanced and detailed in a way. Last is the romantic style incorporated with an extreme attention to detail possessing elements of softness. These factors should always be considered in choosing a veil, the length, the color, the width, decoration and tier to create the perfect wedding look. 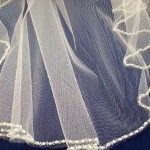 There are different types of veil, length of veil and veil edge points that can match a dress perfectly. Blusher Veils- There are different styles that can be paired with a sophisticated style of wedding gowns. Blusher veil is something one should consider if the bridal gown has a high neck detail. This type of veil looks a lot like what the fascinators use in events like horse racing. Elbow Length- Falls around the elbow with an approximate length of 25 inches. Romantic ball gown type of dresses works well with this length because the veil ends where the skirt’s fullness begin. Fingertip Length- Approximately 36 inches long suiting different styles of majority of the dresses. It is known to be one of the most popular lengths. It reaches the fingertips when the arms are stretched out. 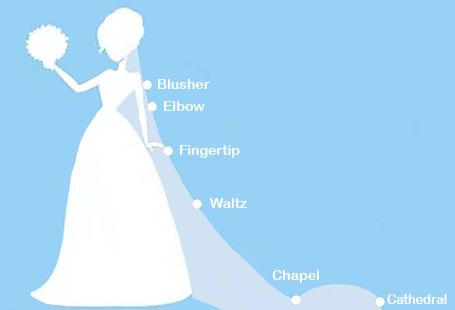 Waltz Length- The length is at a 54 inch falling between the person/bride’s ankle and calves. Chapel Length- Typically around 90 inch of length, paired best with gowns featuring a train. The veil usually drapes into the floor and is slightly shorter than the cathedral length. Cathedral Length- A very formal type of veil around 120 inch long that can be extended to nine feet and is the longest type of veil that works best with a classic wedding gowns having a full length. Cut Edge - This edge allows the wedding gown to show through, having a disappearing effect and creating a simple veil. Once the veil is cut, it is left alone to create the effects. Pencil Edge - Most wedding gowns work well with this type of edge. The tightly covered edge has a fine narrow finish that creates a simple bridal veil. Ribbon Edge - Veil with a sewn satin ribbon on the edge creating an absolutely stunning style. It is available in any color of dress. 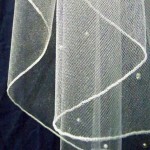 Beaded Edge - this type of veil can have faux pearls, crystals, combinations of both and other beads. In creating this style, the beads are sewn manually along the edges back to back. Perfect for outdoor or weddings on the beach because the beads add weight very helpful during a windy day. This type of veils is definitely fabulous. Scalloped Edge - A design that goes well with wedding gowns having a scalloped lace showing the beautiful flowing curves highlighted at the edge of the veil. 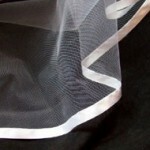 This veil has a flat curved edge that comes with a pencil edge design. It should be noted that other trims or edges will not work with this. 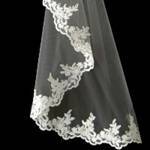 Lace Applique Edge- This veil usually has a satin stitch around the edge. The decoration from a fabric is stitched into another. Veils should suit or blend in with a wedding gown. There are a lot of shades and varieties to choose from. We offer unique colors you can match to go with your gown. Different shades of veils include ivory and white shades, majestic and silver shades where you can choose to have a shimmer finish or a regular finish. A veil having a regular finish shows a more traditional appearance whereas, veils with a shimmer finish gives out a discrete kind of shine that can be very stunning under the right kind of light. There are choices between a one tier veil, a two tier veil and a three tier veil and choosing a type would most likely depend on the style of the dress. A sophisticated look suits a one tier veil; a romantic dress look creates more benefits using a two tier veil or a three tier veil and a classic dress require two tiers at least. Simple hairstyles go well with multiple tiers because a hairstyle will be most likely covered under the tiers. The blusher is a typical type of tiers and a part of a veil used in covering the face of a bride at the start of the ceremony. Choosing whether or not the face of the bride will be covered mostly depends mostly on the bride as she has the freedom to decide not like the past where brides use what they are told to. Most brides choose the idea of covering their face because the part where the husband lifts the veil for the first kiss is said to be romantic. Wearing a blusher should go with selecting a veil allowing the bride to flip the blusher away from her face or at the back of the head before the ceremony of the first kiss. Selecting a veil that has a shoulder length is best because a common blusher has a measure of 30 inches and having a veil short in the back could look very odd. Blushers should be kept in a 30 inch length to avoid getting it tangled up with the flowers. The finishing touch of a veil can be done in many ways, if the dress has a simple look, choosing a decorative edge would be more appropriate. Thicker ribbon edge can look very good with a structured dress while a simple cut edge can work really well with a romantic type of dress. There are different aspects to be considered in selecting the perfect veil to match a wedding gown. These aspects fall into different categories with different descriptions that should be knowledgeable to women planning a wedding. An aspect to consider in choosing a veil would be the shape of the face because a veil’s tends to frame the face. Round Face- A veil reaching a shoulder length to have volume on top of the head should be the choice in selecting a veil because women having a round face virtually look wide and long so this type of veil will make the face look longer and slimmer. Never choose a veil with too much detail on the side of the face. Square Face- choosing a veil that can soften a face and add length will go well with a face typically looking wide and angular. The veil should reach the shoulder length to give volume on the top of the head. Softening the angular jaw line of the face can be done with the help of a circular or cascading style. Oval Face- A shape well balanced described to be slightly longer similar to a shape of an egg. Because this shape is balanced, experimenting on different kinds of veils is advised as long as veils with extreme volume and width would be avoided to maintain the face proportions. Rectangle Face- veils with styles and width around the face and no height on top of the head is the best choice for this type of shape because a rectangle shape face looks longer than wide appearing to be narrow and angular. Body shape is another aspect in choosing a veil; a person’s body shape can be corrected with the right type of veil. A long veil extending to the fingertip or below the fingertip will benefit women who have a large bust or a large stomach elongating the upper body. Pear shaped women - veils that end in the shoulder length or elbow length is most fitting for this type of body. The length of the veil draws attention to the smaller points of the body rather than the width of the hips. Shorter women - a waist height or a veil with a length above the waist matches perfectly for short women. A woman’s hairstyle is the basis of determining the head piece and the sort of veil to be used. Having a heavy head piece, a multiple tier veil and a long veil need to be supported by a hairstyle like a bun while moderate length and weight of a veil works well with a hairstyle half up or half down. Wearing a hair down is better to stick with a light or shorter weight of designs. Several types of hairstyles can look good with the veil attached in the front of the head and others look good with the veil attached further down the back of the head. So considering the placement position of the head is also important. Women with shot hair need the veil to be attached towards the front of the head and women with longer hair can show of the hairstyle up-do putting the veil further down the back of the head. Veils having a wide set of proportion should be worn towards the front of the head and veils that do not have that type of width should be worn at the back of the head. Buying the veil in advance is a good idea so the veil can be tried on different kind of hairstyles. The veil can be placed together with a comb or bobby pins using a crown, a flower, a bowknot, a headband or a tiara. 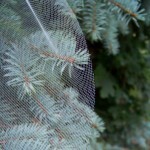 A location of the wedding is also one thing to consider in selecting the perfect veil. The veil should be very appropriate for the wedding location. A formal wedding in a large church can be a show stopper using a cathedral style veil. This on the other hand can turn out to be a disaster if the setting would be in a small chapel. A small chapel requires the length of the veil to be shorter because a long veil cannot be properly shown of in a small setting. And in order to maximize the use of a cathedral length veil, further assistance from the attendants is required. Other considerations should be taken under consideration of the location of wedding is an outdoor ceremony. Things that should be considered are; the sand, the wind or the dirt that can interrupt the ceremony. To keep the veil in a proper condition, the length of the veil should only be shorter or exact knee length. The condition of the climate should be thought of. In a setting of a hot and humid weather, layers are not ideal for this setting because it would not be pleasant to be swathed with a veil than can stick to your skin so a veil that can do well in this setting is a blusher veil. Though a lot of brides aren’t that worried about these factors and the trailing their veil can experience when walking in an isle of sand, or in a pile of dirt walking in a garden setting, it should be taken into account that a setting where winds cannot be controlled would be hard to work with and the flow of the veil can also not be controlled.